Home page You Pay an Agent 6% … For What? Do You Actually Know? YOUR LUXURY HOME IN HOUSTON? When you choose your Agent, you choose the level of marketing your property will receive. So spend time discussing with your potential agent how they market listings — and be sure you are on board with their plans for your property. We are not real estate agents. We specialize in marketing high end luxury homes and have a wide product slate of patented and proprietary tools and techniques that agents just do not have available to them. An agent can hire us to do the marketing for your property and gain access to our expertise. The Agent will Ask … Does This Work? -and- How Much Does it Cost Me? Cost to the Agent? Whoa.. Back Up … Let’s start with commissions/cost to the Home Seller. 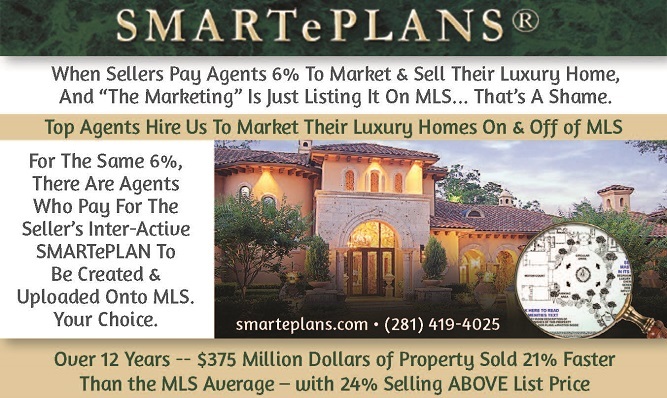 As a Seller you are already paying your agent 6% to market and sell your home, so the cost for a SMARTePLAN is already included in “your” 6%, as it is considered a marketing cost. Not getting a SMARTePLAN, but still paying the same 6% … well, WHAT are you paying for? Do you know? Obviously … if an Agent is charging you $30K to market and sell your luxury home …..and putting it on MLS with professional photography costs $600-ish … than you’ll want to understand what “other marketing” is in their tool-kit that you are already paying for …. and the total effort / costs actually budgeted towards marketing YOUR home. HOW MUCH DOES IT COST TO PUT IT ON MLS w/PROFESSIONAL PHOTOGRAPHS? HAR membership dues are $414 a year which provides access to the members-only MLS system — whether an agent lists a single home on MLS, or hundreds of homes in the course of the year. Photography is another expense and can vary widely. This link is to TK Images, one of the finest real estate photographers in the city and their price sheet for agents. .. a premium professional photo package of 32 photos is $170, a 32 photo virtual tour is listed for $45 .. and you can see many more services are available, with varied prices. So “putting your home on MLS” with the MLS maximum of 32 professional photographs is in the $600-ish range — and well over half of that includes the agent’s MLS Fees FOR THE WHOLE YEAR — not just devoted to the benefit of your property. Marketing costs vary and encompass a wide range of fees and expenses. But if the agent’s “marketing” pretty much boils down to “putting it on MLS” than the costs for a $100,000 home are pretty much the same as for a $2.5 million dollar home. Or to put it another way … if all your agent is doing is using professional photography and uploading it onto MLS .. then by their marketing, they are reducing your luxury custom home to the same level as a $100,000 Texas tract home…. and that’s a shame. Below is a quick calculation on two different property prices. The 6% a Seller pa ys does not all go into their agent’s pocket. The total 6% is split in half with the other agent who brings the buyer, and then more than likely your own agent splits what’s left with their own broker — according to whatever split agreement they have in place with their broker (which can vary widely). One of the major factors for an agent in setting a marketing budget is (of course) the amount of anticipated commission being paid to them from the property sale. Since all their expenses are paid up front, long before the property closes, the amount they spend on marketing has to be in line with their anticipated commission at the close of the transaction. Investigating the effectiveness of SMARTePLANS in the marketplace — and the cost —- are important issues to your agent, as not all agents budget the same for marketing and they more than likely already have a marketing plan budgeted for their properties. SMARTePLAN fees are calculated by the square foot of the structure, so the cost will vary by the size of the structure and number of structures / features on the property. The cost includes embedding up to 14 photos your agent provides into the custom drawing so they launch out of the floor plan. The average SMARTePLAN price for properties over the past 2 years ( $ 1,360.00) included not only the structures, but also all the grounds and landscaping and a very detailed amenities text description inter-linked with the drawing and photographs. Since Buyers BUY the whole property — we SHOW THE WHOLE PROPERTY. The SMARTePLAN marketing system has been used with a wide range of properties, everything from a 42′ luxury sailing yacht to a 14 acre equestrian ranch; the most expensive property utilizing our marketing to date was listed at $43 million dollars. Below is data from just the last two years — and shows you both ends of the spectrum. Since Texas is a non-disclosure state, I’m not allowed to tell you the address and final sales amounts, but am providing the MLS numbers so your agent can look them up in the MLS proprietary database and print it out for you. In no way are photography and MLS fees the extent of marketing costs to an agent .. that’s just the beginning … and marketing expenditures differ dramatically between agents. Each agent has their own way of doing things and you really owe it to the agents you are considering for your listing —- to let them explain what they can do for you, and how they choose to do it — based on their own background, years of experience, knowledge and expertise. You need to understand their marketing plan for your property and be onboard with it. We work with some of the top agents all over the city, have a high degree of respect for their experience and look forward to working with your choice of agent — on your behalf. The Website has a whole section of information compiled for home sellers, answering questions and providing information. Please call me or send me an email if you have any questions. Best wishes for a rapid sale and seamless closing. ALWAYS LESS THAN YOUR FIRST PRICE DROP!